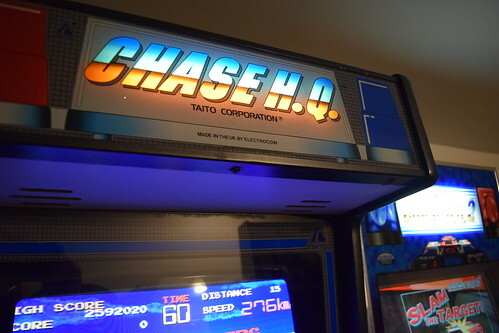 New Arrival – Electrocoin Chase H.Q. 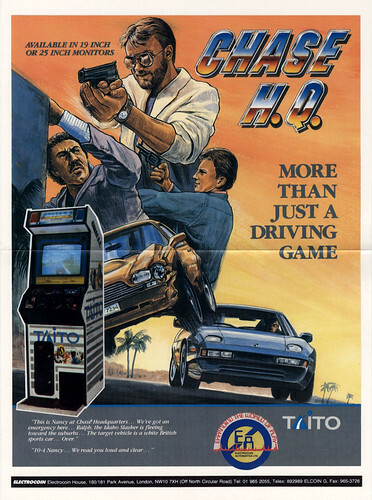 This was one of my favourite arcade games back in the day and is just as awesome as I remember it. 1. Outside of cab cleaned with magic erasers. 2. Scratches on side art and front art touched up with Sharpies, and a few areas of white touched up. 4. Marquee glass cleaned. Retainer strips cleaned and chips touched up. 7. Replacement US250 PSU fitted. 10. NOS high / low metal plate fitted. 11. Pedal blasted and powder coated. 12. 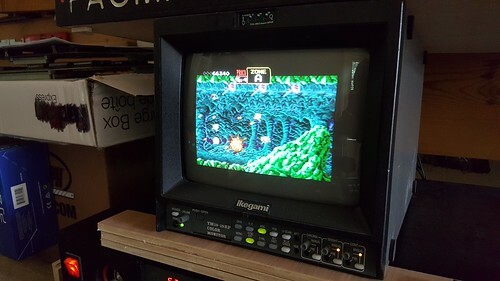 Monitor fully serviced with cap kit and new lopt. 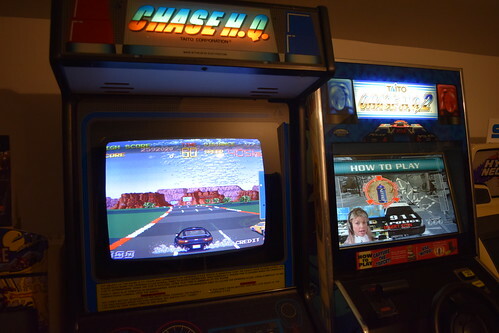 -The cab is fully working and plays perfectly. -The monitor was fully serviced a few years ago and has a great picture with no visible burn. -The flashing pursuit lights work correctly. -Overall the artwork is very nice. The left hand side art is near perfect. 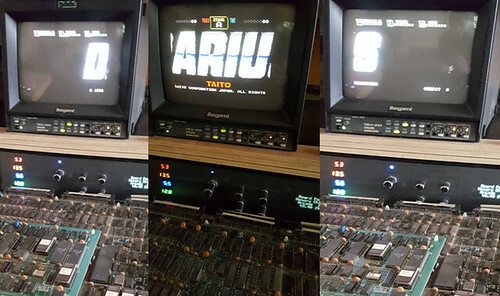 The control panel overlay, marquee and bezel are in excellent condition. 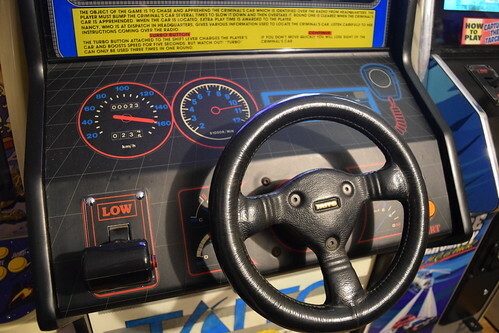 -The steering is perfect and stops like it should. A common fault on these is the steering wheel spinning endlessly. 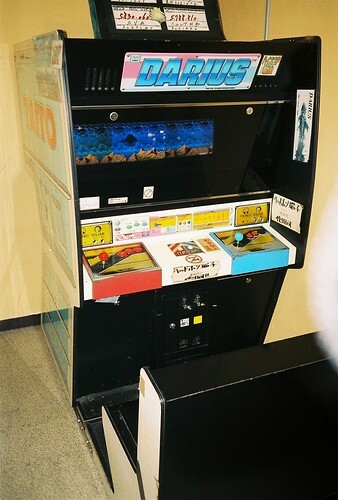 -The wheel is in excellent condition and has the original Taito emblem. 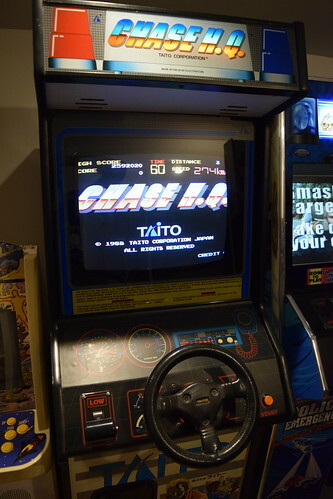 -The cab has the original Taito shifter with turbo button. -The foot plate matting is original and in great condition for its age. -It came with original locks and key. -The right hand side art has some wear and marks around the T-moulding. 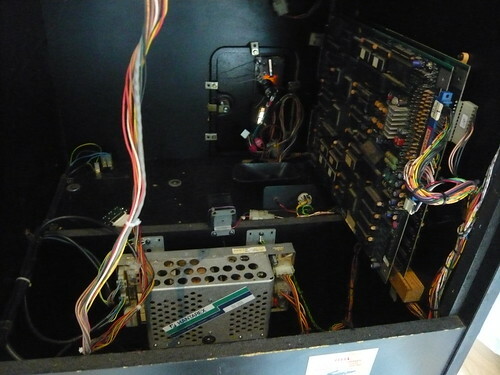 -There is some small damage to the art on the front of the cab between the pedal and the coin box door. -There is one small break in the top white vinyl below the marquee on the right. -The bezel glass has one tiny indent. I’m really pleased to have these two together at long last! 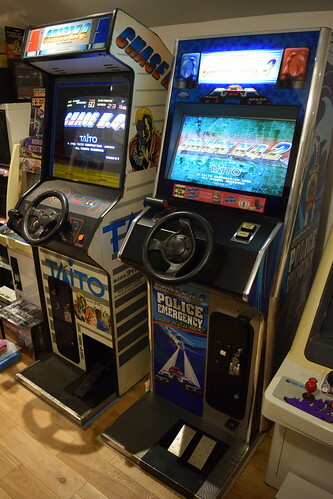 Sega Taikan cabs were massive crowd pleasers back in the day, wowing arcade goers with the very latest arcade tech. 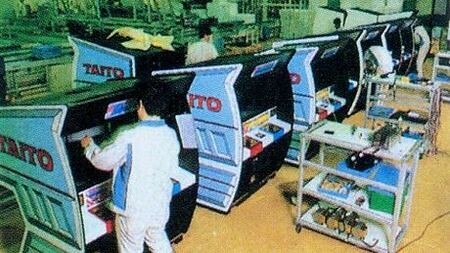 Not to be outdone, Taito’s response to this was the incredible Darius triple-screen cabinet, released in 1987. Darius was the highlight of my recent Raid in Weymouth. 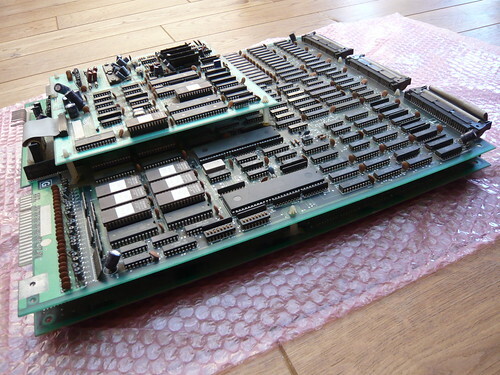 I must admit I was pretty shocked to see this one in the crate amongst the PCB’s, although the large triple layer boardset isn’t exactly hard to miss. Just look at the size of it, it’s almost as intimidating as those mechanical aquatic monstrosities which appear at the end of each level! 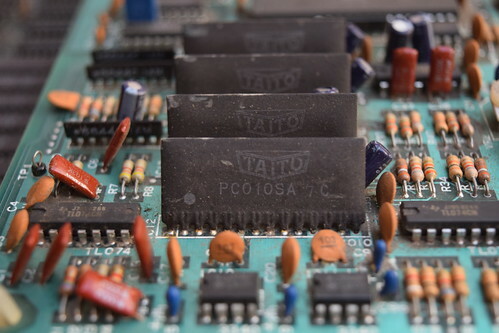 The PCB is a little dusty, but is otherwise in very good cosmetic condition. 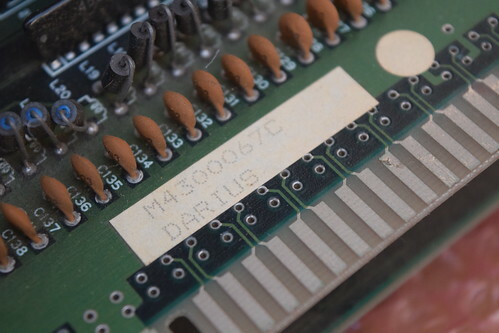 Aaron, aka GadgetFreak (Ukvac) very kindly made a custom harness to test my Darius PCB. 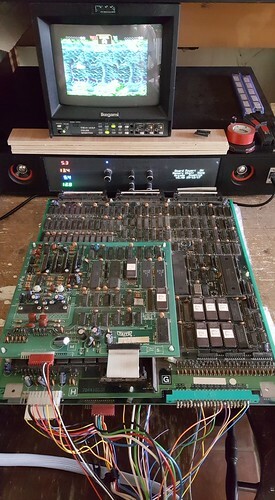 Given that the board is thirty years old, the complexity and the fact it had been stored in a dusty crate, I didn’t have high hopes. Needless to say I was absolutely amazed to find it’s fully working! On the first boot up, we did get a Ram Error, possibly because all the power points weren’t connected. 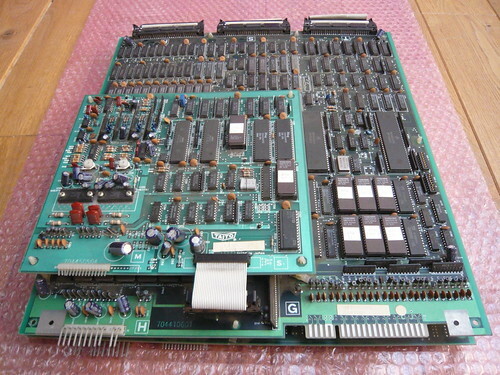 However the board was tested numerous times afterwards and proved to be fully working. The game plays surprisingly well just using the centre monitor. At first we were a bit concerned sprites were missing, but then remembered it was designed for triple-screens. Only the centre monitor was connected and the ships were still off screen! Here is a short video of Darius up and running. Here are three shots showing the left, centre and right monitor. 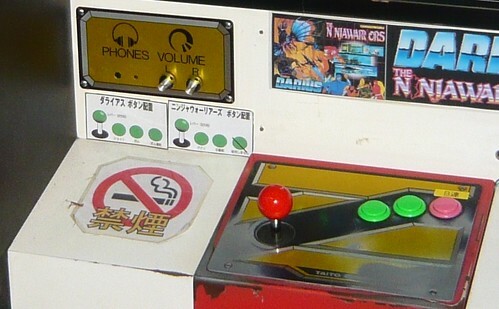 In order to seamlessly connect the three-screens together inside the arcade cabinet, the left and right monitors were placed underneath the playfield, facing upwards, with their visuals reflected into view via a one-way mirror. 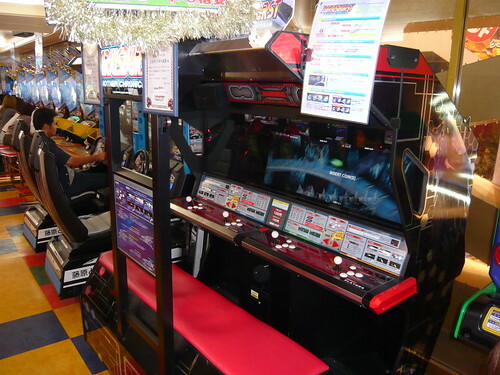 The centre monitor was placed behind the mirror and is the only one actually facing the player. 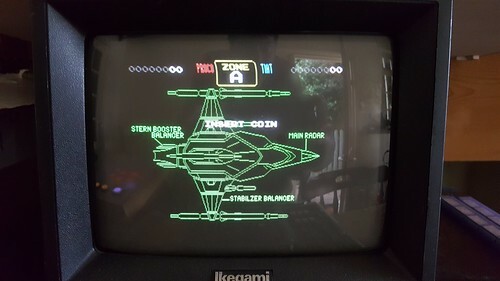 The reflection of the two bottom monitors partially overlaps the third monitor, giving the illusion of a seamless massive horizontal playfield. 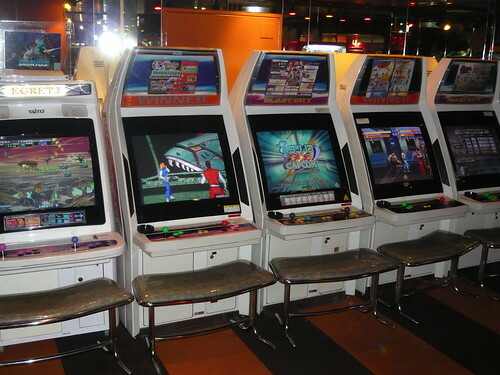 The placement of the monitors can be seen in this pic of The Ninja Warriors, taken at Mikado game centre. The music is absolutely fantastic and is one of the first great soundtracks to come from Zuntata, Taito’s in-house band. 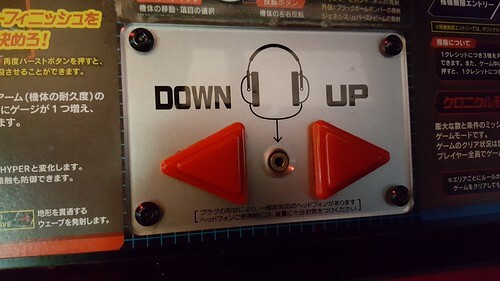 The PCB has left and right channel headphone outputs and the cab came equipped with headphone jacks, another innovative feature. 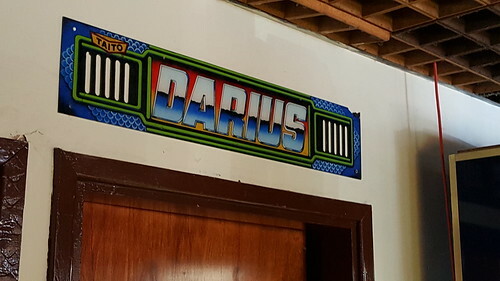 The website shmuplations.com has a report entitled ‘The Making of Darius’. 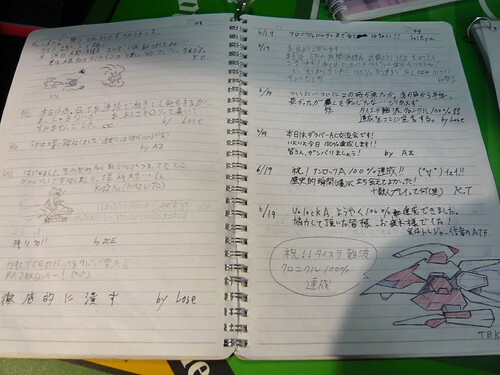 This is a translation of an article which originally featured in the 4/87 edition of BEEP! magazine. It’s an excellent read about Darius and its development, and includes an interview with the team behind the game. There are some great insights. I found it fascinating to hear that once they got the three monitors working seamlessly, there was a lot of debate around what type of game to make and that there was even an idea to make all three monitors vertical! 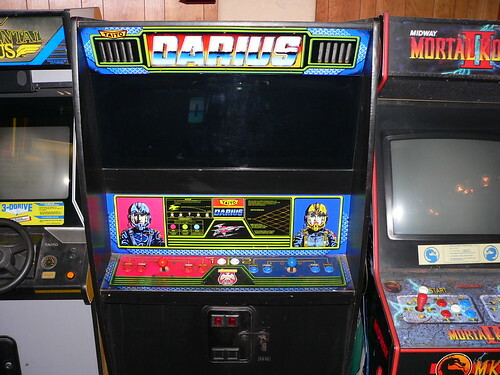 When asked about Darius, John Stergides noted “The game was built at our factory for the European and Middle East markets although some units made it to the USA. We built over 100 units and the machine sold for £6,000. It had a moderate income.” Hopefully there are still a couple of machines out there, gathering dust, just waiting to be found! 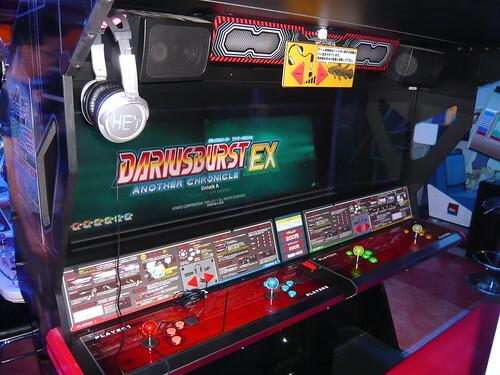 Here is an Electrocoin Darius cab at ‘Jim’s Arcade’ on Blackpool seafront, by the Pleasure Beach, back in 2009. The picture is used with kind permission and remains the copyright of Steve Rich. 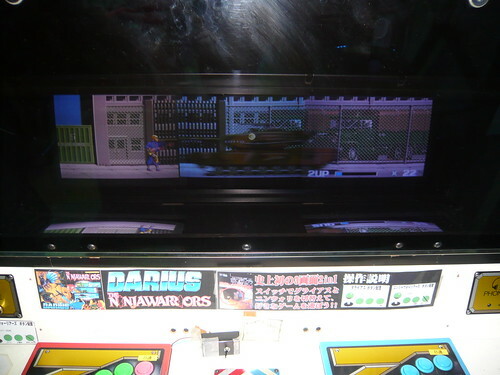 I don’t recall ever seeing a Darius cab on these shores, although I did see The Ninja Warriors triple-screen cab many years ago on a school trip to the zoo. There was a fault, either the controls weren’t working correctly or a monitor was dead, and the cab had an ‘Out of Order’ sign prominently displayed. I remember removing the obtrusive sign, putting one or two ten pence pieces in it anyway and having a go. The cab must have made quite an impression on me as that’s the only thing I can remember about the trip! 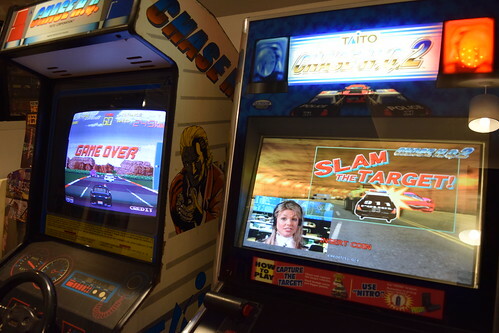 I recently visited an arcade on Fleetwood seafront whilst on holiday. 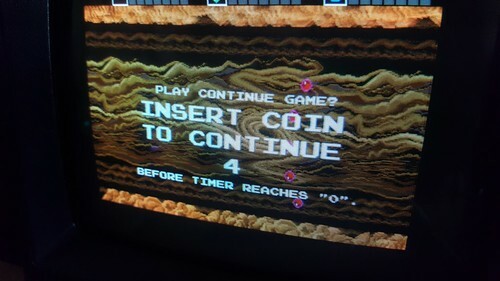 The arcade had various fruit machine glass and video game marquees displayed on the walls, and I was particularly intrigued to see this one. 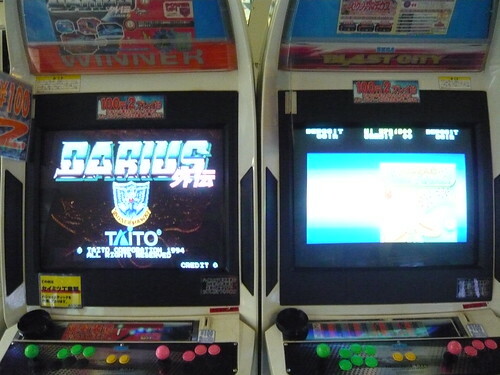 Here are some pics of the awesome Darius games I’ve played in Japanese game centres. 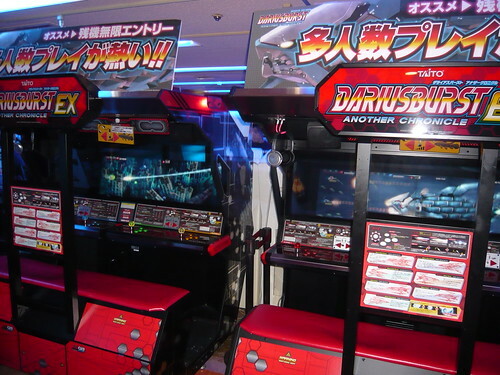 The awesome Dariusburst: Another Chronicle EX. 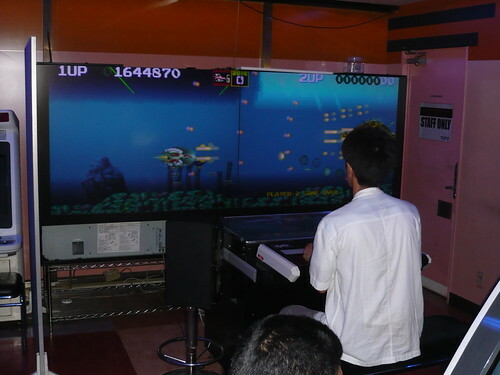 The game runs on the PC-based Taito Type X² hardware and continues the multi-screen design with two 32” LCD screens. 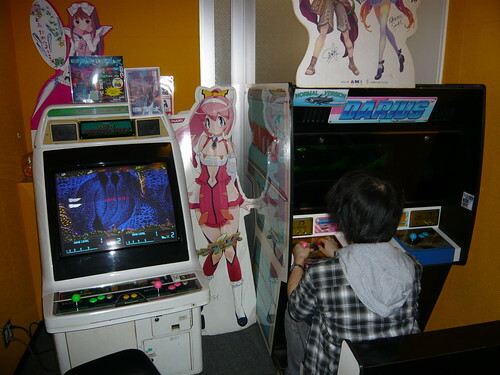 One monitor faces the player, and there is a mirror next to it. The other monitor faces upwards with a flipped image, and angled mirrors are used to create a seamless, double wide screen. The cab also features vibrating body-sonic seats and headphone jacks. A pretty impressive Darius II set-up. 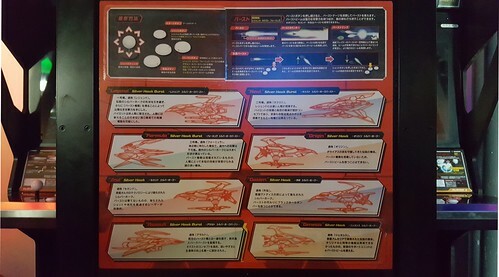 Both Darius and The Ninja Warriors were selectable via a switch. 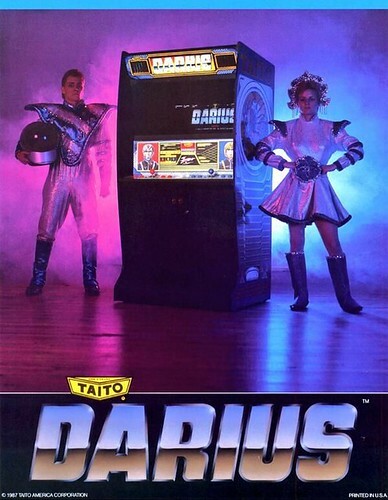 The Darius II is a duel-screen cab. 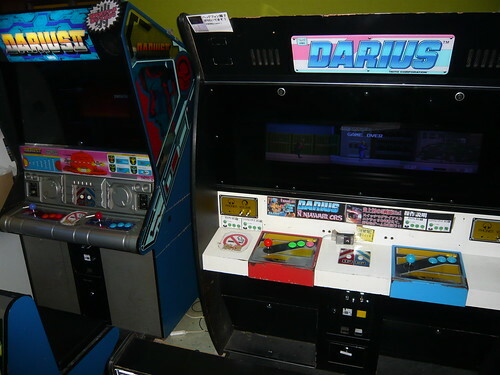 Interestingly two different versions of the Darius II PCB were produced, one for duel-screen and one for triple-screen. 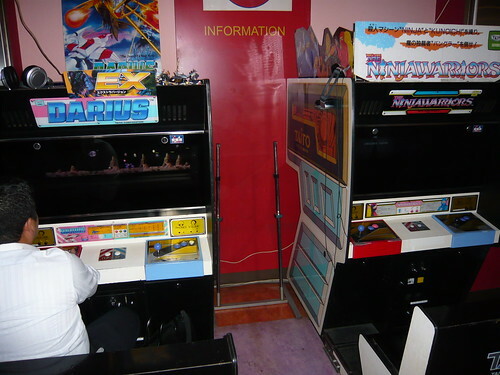 G-Darius and Darius Gaiden are on the left of the row. 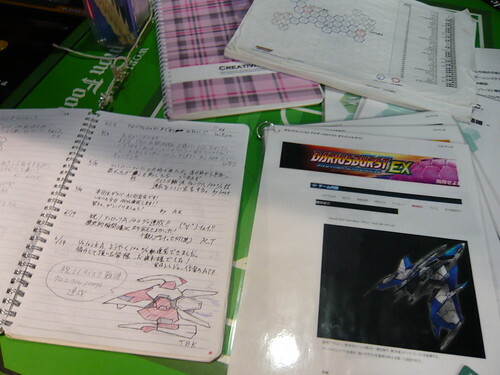 When I visited Taito Station in Osaka back in 2011, I loved that there was a book for fans to write comments and exchange tips about Darius Burst. 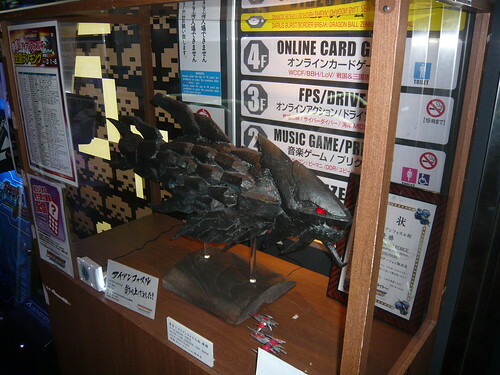 I would love one of these in the games room! 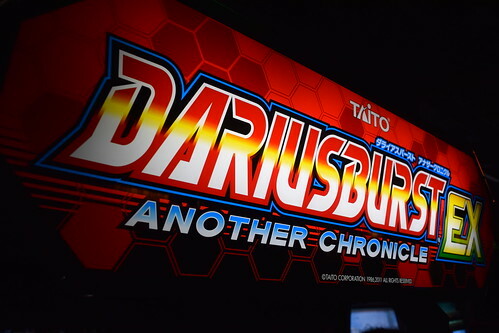 On these shores, Dariusburst: Another Chronicle EX can now be played at Arcade Club, Europe’s largest free play video and pinball arcade. 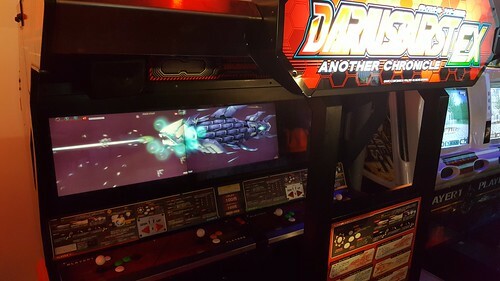 It’s fantastic to see Dariusburst back in the UK after having an all too brief spell at the now closed Casino arcade in London. 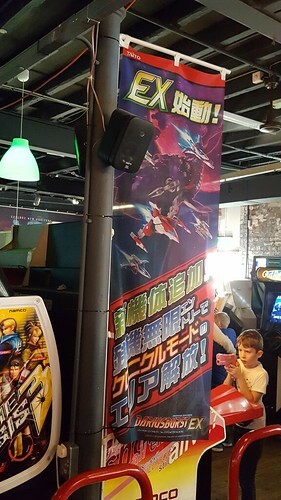 Check out the awesome Dariusburst banners! Darius is incredible for its time and its legacy lives on. 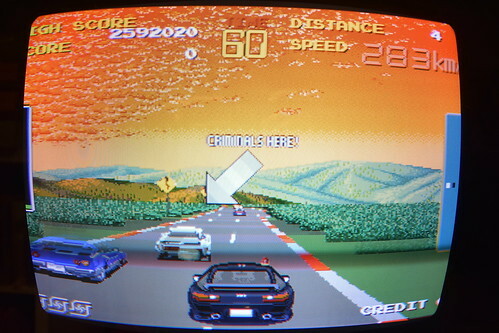 The game has a large following and there have been many sequels released over the years for the arcade as well as home systems. 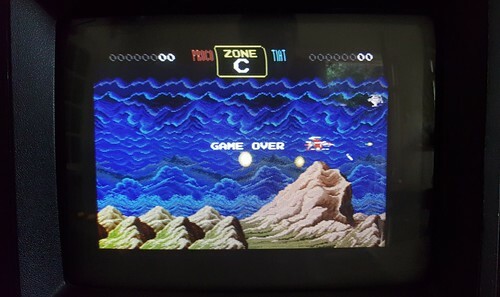 In fact Taito has recently announced Darius Cozmic Collection for the Nintendo Switch, a compilation of classic Darius titles, due for release early next year. Darius is a landmark title and the legendary series will be enjoyed by gamers for many years to come.